As individuals age, memory loss can sometimes occur, resulting from both the natural aging process as well as from medical conditions like Alzheimer’s disease and other dementias that are progressively degenerative and irreversible. Dementias can affect an individual’s daily functioning and quality of life, as well as place a significant burden on family caregivers. While little is known about dementias among Indigenous populations in Canada, they are recognized as an emerging health issue in these communities. The Indigenous seniors population, while proportionately smaller than the general Canadian population, has been growing rapidly and rates of dementias are expected to increase due to a higher prevalence of risk factors in the development of the disease, including diabetes, midlife hypertension and obesity, physical inactivity, lower levels of education, and smoking. Further, Indigenous people face a host of barriers in accessing health care, including access to dementia care services and supports. This paper aims to identify the challenges and burdens Indigenous people in Canada face in accessing culturally safe and appropriate dementia care services and supports, and suggests ways of overcoming these challenges. 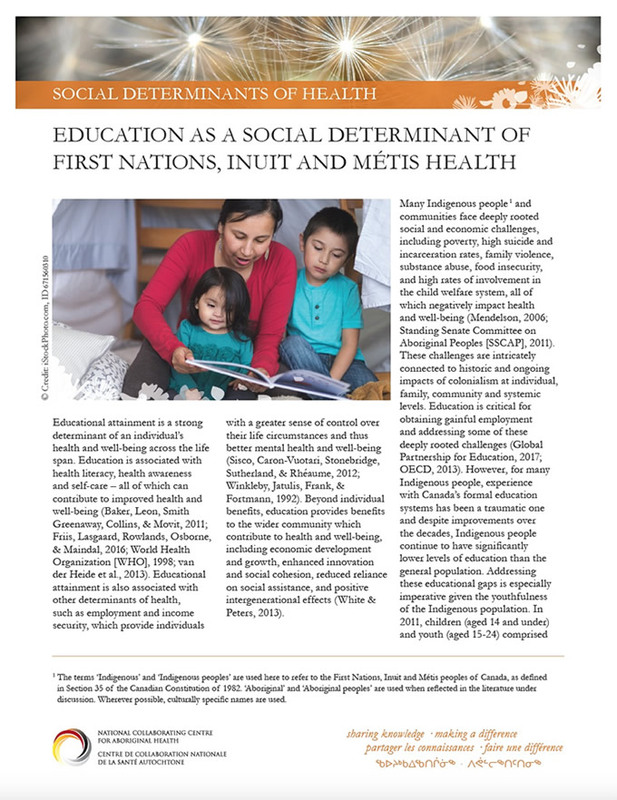 It begins by providing an overview of the general challenges Indigenous seniors face in accessing health services, then summarizes the literature on Indigenous perspectives of aging well and caring for loved ones with dementia, as understanding these perspectives is essential for developing programs and services that are responsive to their needs. Key elements of a culturally safe framework for dementia care for Indigenous communities and examples of innovative dementia care services for Indigenous peoples concludes the paper. In 2015, the United Nations released a new 15-year agenda, the Sustainable Development Goals (SDGs). Unlike its predecessor, the Millennium Development Goals Agenda, which focused on eradicating hunger and poverty in only the poorest countries, the SDGs Agenda aims to eradicate poverty in all its forms everywhere, while also addressing the global challenge of sustainable development. This report provides a brief history of the SDGs and an overview of Indigenous peoples in Canada. It then assesses the current state of progress on the SDG targets for Indigenous peoples in Canada and suggests ways that the SDG agenda can be used to improve Indigenous peoples’ socio-economic and health outcomes. The report underscores the role that poverty plays in the health disparities Indigenous people face and the need for comprehensive poverty alleviation strategies that address the various situations that lead to and result from poverty to ensure Indigenous people in Canada are not left behind during the period of the SDGs. This includes addressing issues related to environmental conservation and development, Indigenous peoples’ self-determination, governance, and land rights, as well as socio-economic inequities. Children rarely complain when they have vision problems because they don’t know that their vision isn’t normal. They think that everyone sees the world the way they do. Parents and teachers have an important responsibility to recognize the signs of vision problems in order to identify children who need a complete eye examination. Children and Their Vision: What Parents and Teachers Need to Know contains accessible information about why establishing comprehensive eye care early in life is important for a child's long term development. Each of these elements are discussed in detail with specific attention to the health, well-being and safety concerns when poorly funded, maintained or absent from First Nations reserve communities. The paper starts by introducing how Indigenous peoples in Canada deliberately planned and designed their communities so as to thrive within their territories prior to colonization. It then turns to how colonization altered Indigenous peoples’ home and community environments thereby contributing to many of the on-going social and health inequities currently experienced by them. The paper concludes with some advances and success to improve the built environments of on-reserve communities. Indigenous children are often denied timely access to critical healthcare and social services that are available to other Canadian children. This is primarily due to chronic underfunding and jurisdictional disputes and confusion over the funding of services. To ensure that Indigenous children have equitable opportunities, developmental and health trajectories, and quality of life and well-being across their life course as non-Indigenous children do, a critical examination of Indigenous children’s rehabilitation is needed. This paper, authored by Alison Gerlach, PhD, summarizes knowledge about rehabilitation for Indigenous children with developmental challenges, disabilities, and complex health conditions. It explores the relevancy of the concepts of ‘disability’ and ‘rehabilitation’ within the settler-colonial context of Canada, highlights emerging themes in the literature on rehabilitation with Indigenous children in Canada, and identifies current gaps in knowledge and areas for future research. 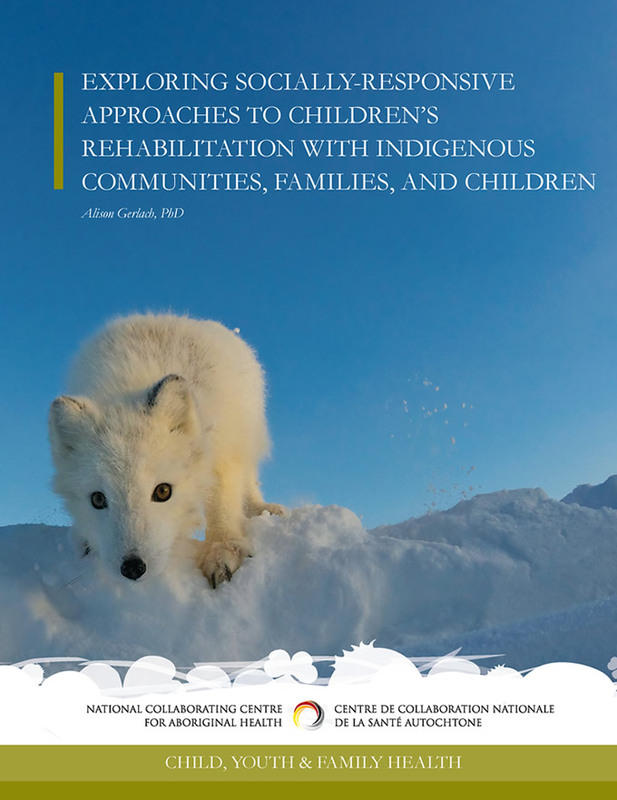 The paper argues that in order for children’s rehabilitation to be responsive to the lived realities of Indigenous communities and families, service delivery models, policies and practices must be informed by an understanding of dis/ability in relation to the multifaceted, historical, and ongoing effects of colonization. This requires a radical shift in service delivery grounded in Indigenous self-determination and human rights. 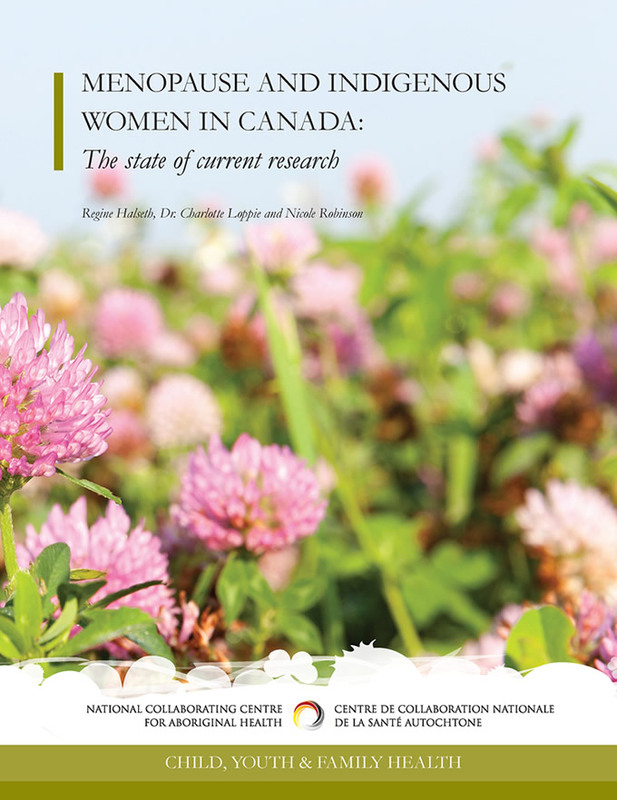 This study, authored by Regine Halseth, Dr. Charlotte Loppie and Nicole Robinson, aims to identify and summarize the state of research on menopause and Indigenous women in Canada; suggest how this existing knowledge can be applied in practice; and identify where further research is required. Specifically, the study identifies and summarizes published research on the characteristics of menopause; Indigenous women’s perceptions and experiences of menopause; strategies for addressing challenges associated with changes during peri- and post-menopause; and health outcomes associated with menopause among Indigenous women in Canada. The study concludes with a number of recommendations to optimize the health and wellness of Indigenous women throughout the menopausal transition. 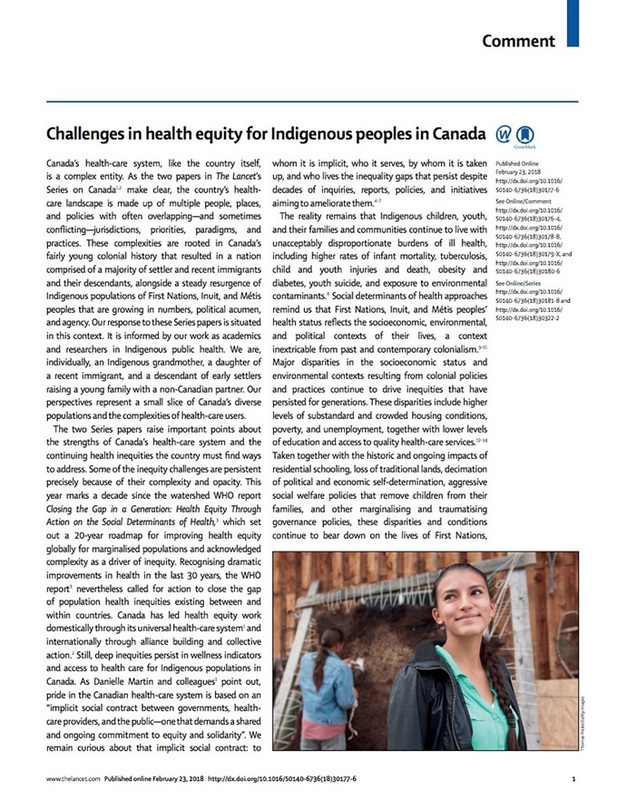 In their commentary on two papers in the Lancet’s Series on Canada, authors Greenwood, de Leeuw and Lindsay draw attention to the persistent health inequities experienced by First Nations, Inuit and Métis peoples, despite Canada’s commitment to addressing health equity both domestically, through its universal healthcare system, and internationally. These inequities are rooted not only in historical and contemporary colonialism, colonial policies and legislation, but are also perpetuated by unique barriers to accessing healthcare. Alzheimer’s disease and related dementias are recognized as an emerging health issue in Indigenous communities. Indigenous older adults are considered to be among Canada’s most vulnerable citizens because they often face complex health issues stemming from socio-economic marginalization and a legacy of colonialism, and they face a host of barriers in accessing healthcare. They have higher rates of many of the risk factors for dementias. As a result, the rates of ADRDs are expected to increase more rapidly among Indigenous older adults compared to non-Indigenous older. Despite this recognition, relatively little is known about Alzheimer’s disease and related dementias (ADRDs) among Indigenous populations in Canada. 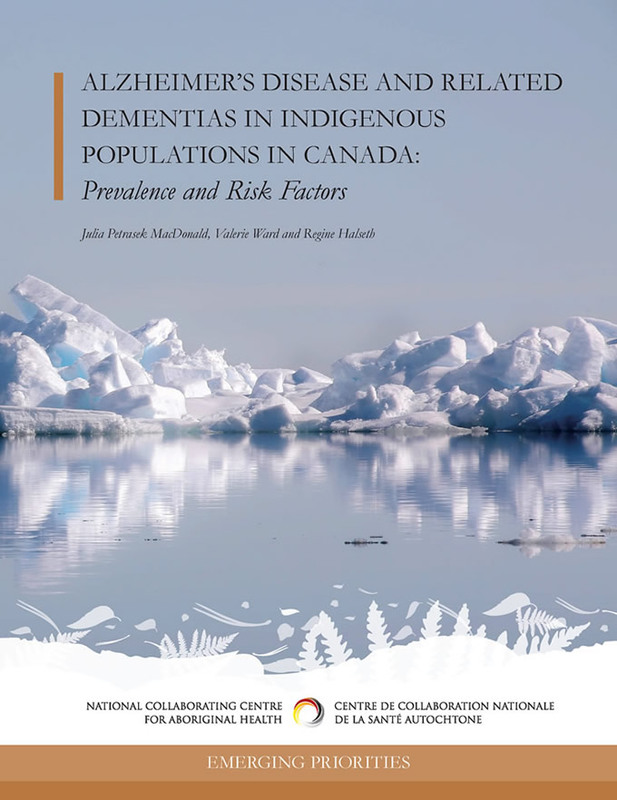 This paper summarizes what is known about the prevalence of ADRDs, the challenges associated with diagnosing dementias, and the risk factors associated with the development of dementias in Indigenous populations. The paper highlights several knowledge gaps with respect to the prevalence of various forms of dementia among the different Indigenous groups, as well as differences in the way dementias present in Indigenous populations. The paper concludes by highlighting the need for integrated multi-sectoral approaches to address socio-economic equities and health disparities as preventative measures for ADRDs. 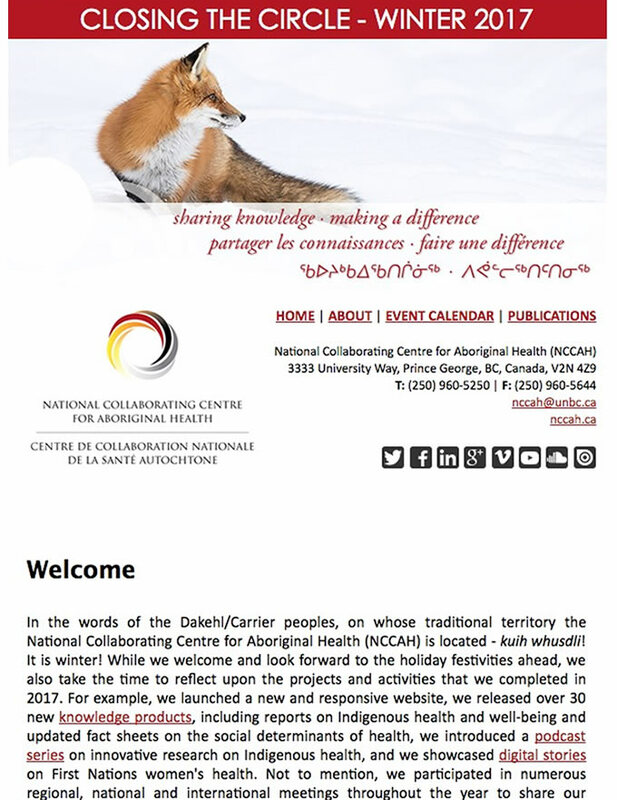 In the words of the Dakehl/Carrier peoples, on whose traditional territory the National Collaborating Centre for Aboriginal Health (NCCAH) is located - kuih whusdli! It is winter! While we welcome and look forward to the holiday festivities ahead, we also take the time to reflect upon the projects and activities that we completed in 2017. This fact sheet examines some of the key factors contributing to or hindering academic success for Indigenous peoples in Canada, including historic and contemporary impacts of colonialism, socio-economic marginalization, educational funding inequities, and personal reasons. While current trends and levels of educational attainment are on the rise, there are multiple ways for improving Indigenous learning. Specifically, decolonizing approaches like land, language, culture, and Indigenous knowledge-based pedagogies and curriculum are addressed. The fact sheet concludes by highlighting some promising practices in advancing education among Indigenous peoples, from early learning and care initiatives to post-secondary studies.